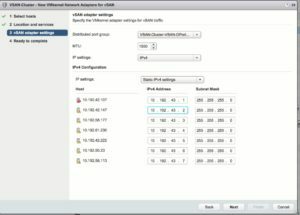 A key part of vSAN 6.6 improvements is the new configuration assist menu. Common configuration requirements are tested, and wizards can quickly be launched that will do various tasks (Setup DRS, HA, create a vDS and migrate etc). One of my least favorite repetitive tasks to do in the GUI is setup VMkernel Ports for vSAN and vMotion. Once you create your vDS and port groups, you can quickly create these in bulk for all host at once. Once you put in the IP address for the first host in the cluster it will auto fill the remainder by adding one to the last octet. Note, this will use the order that hosts were added to the cluster (So always add them sequentially). Note you can also bulk set the MTU if needed.